Hoping everyone had a fantastic weekend and managed to enjoy the great weather! Just a quick reminder about tomorrows Spring Concert. We look forward to seeing you there. *All students are expected to stick to their designated areas during downtime and eat their packed supper and get changed into concert dress when they can. For anyone looking to complete a concert review or just to come and be inspired please consider coming out to Broadway Theatre this evening for and a magnificent evening of music in a diverse meshing of styles and sounds. 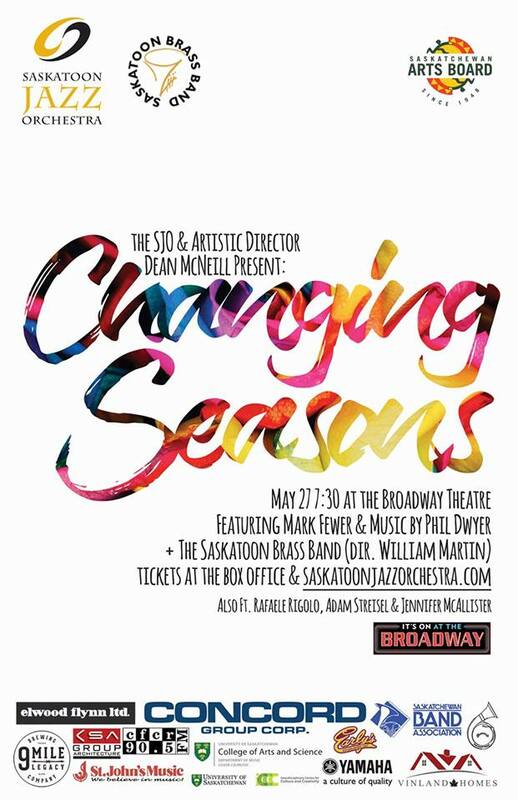 World renowned Violin Soloist Mark Fewer is performing with both the Saskatoon Jazz Orchestra and Saskatoon Brass Band this evening 7:30pm at Broadway Theatre. The concert will also feature solos from Adam Streisel and the Saskatoon Symphony Strings. A huge congratulations and thank you to all Intermediate and Senior students that took part in the In-Division tour over the past two days. This is invaluable preparation for this Mondays concert but also is a chance for students to display our years work in our home schools and communities. The year-end concert is finally upon us as all of our seven communities come together to perform at Lakeview Church this coming Monday at 7pm (doors open at 6:30pm). All students will be bussed from their home schools directly after school to the concert venue to rehearse and prepare. For any further questions please do not hesitate to contact your Music Teacher. Hello again and thank you to our magnificent Intermediate students that played fantastically today in Clavet, Hanley and South Corman Park. ALL senior students are on tour tomorrow performing in Allan and Aberdeen. Please see the below and attached details. All students will be bussed from the home schools at 9am. All students will be expected to help with the setup and takedown. There will be chairs and stands to setup for the wind players and the percussionists can look after their equipment. Pease come prepared to pitch in and help someone out. I have emailed all the teachers and admin about this day but it is important that the students also inform the teachers of their absence in advance so they know what they will be missing. Just a reminder that the East Intermediate Division Band (grade 6-8) is performing in Clavet, Hanley and South Corman Park tomorrow. Please see all final details below. The Seniors will not be touring this day but will be touring Allan and Aberdeen on Friday. All students will be expected to help with the setup and takedown. There will be chairs and stands to setup for the wind players and the percussionists can look after their equipment. Please come prepared to pitch in and help someone out. This week marks the start of our year wrap up with the Intermediate and Senior Bands touring within Prairie Spirit School Division. Please see the detials below. Next Monday is also our Spring Division Concert at Lakeview Church. The Senior Band will not be touring with the West Band this year but will be performing as a joint Division Band this coming Monday May 29th. All students (Beginners, Intermediates and Seniors) will be bussed from their home schools to Lakeview church where they will rehearse and perform at 7pm. The coach is just departing from Lloydminster and is currently ahead of schedule. Please find attached all information for Senior Band tour this coming Thursday. Be ready to depart from Clavet at 8:30am on Thursday morning and be in concert dress. IMPORTANT: Keep this on you at all times! Prep: Wear concert dress on the bus and bring a packed lunch. Prep 1: Bring swimwear if you are going to the Waterpark today. Prep 2: Bring your concert dress or suitable concert attire for this evenings concert. Prep: Bring appropriate clothing for outside weather. Please pack only one luggage piece for under the bus and one carry-on for the bus. Remember to pack a lunch for the first day! It would be a good idea to pack some extra spending cash for snacks (or if you want to purchase a larger lunch/supper). Look, act, and be professional. Remember you are representing your community and your band program. Students are expected to remain with the group at all times unless instructed otherwise. While on your free time the Buddy System is to be adhered to. Loud noises are not permitted on the bus as it may distract the driver. Please make sure to keep the bus clean (everyone shares this responsibility). Be helpful. Do not stand and talk while others are working. Be aware that you are guests in the hotel, please act accordingly. Leave the area better than you found it. Chaperones and the bus driver are in charge in the absence of the Directors and their decisions and directives are to be followed. All students and parents must be aware that this trip is a School Division sponsored event and all school rules/regulations of behavior apply. Any student found to be or suspected of participating inappropriately (ex. smoking, alcohol, drugs, breaking curfew, etc.) will immediately be sent home at his/her expense. The Band Directors, School Principals and Superintendent of Schools and Learning will deal with the situation upon returning home. It is a tradition on the tour that we create positive memories to keep forever. This can be in small groups or (Han)solo. We will be presenting these on the return journey of the tour. To help collect your thoughts you can fill in the attached daily journal – Feel free to use bullet points/ lyrics/drawings whatever inspires you. Take this space below to write down events and experiences that happened during the first day of Tour, this will help you with your overall tour assignment to be presented on the final night. You can use bullet points, write a journal, draw pictures, poems etc.. your choice. Take this space below to write down events and experiences that happened during the Second day of Tour, this will help you with your overall tour assignment to be presented on the final night. You can use bullet points, write a journal, draw pictures, poems etc.. your choice. Take this space below to write down events and experiences that happened during the third day of Tour, this will help you with your overall tour assignment to be presented on the final night. You can use bullet points, write a journal, draw pictures, poems etc.. your choice. Thank you for volunteering to be a chaperone on one of the various travel opportunities that our music students are involved in. You are an integral part of the travel experience and your assistance is much appreciated. Please enjoy the trip. Too much noise is usually the only problem on a bus full of students. Gentle reminders are appropriate. Constant offenders should be moved elsewhere on the bus (in front or beside you). I ask that you be present with the director/students in warm-up areas, seated in performance locations, or while being moved. Please check that all rehearsal rooms and warm-up areas are left as they are found and that none of our belongings are left behind. Be prepared to help students with any personal matters; holding wallets/purses, sewing buttons, etc. On overnight trips, you will be assigned a specific number of students and you will become their band parent for the duration of the trip. You will be responsible for room checks, curfew reminders, return of room keys, etc. Remember that you are in charge if the director is absent temporarily. Do not be hesitant to assert your authority if needed. The director will support your decision 100%. Hope you had a great weekend, today starts off a busy week as we draw towards the Spring Concert on May 29th. Students going on Tour must attend. Bus #1 – Paul Baby – Bus #276 – Allan – 12:00p.m. ; Clavet – 12:25p.m. Students will be returned the same time as normal division rehearsals. All Beginners at Aberdeen, Clavet and Dundurn will be bussed at 9:00am from their home schools. Colonsay students will be picked up at 9:30am. All student will be returned for the school end. Students need to bring Instruments, music and packed lunch. And just in case you missed the most important celebrations last week it was National Tuba Day on May 5th and Music Monday on May 1st! For anyone looking to continue playing over the summer and increase their skills PLEASE consider attending one of the great SBA Band camps held across the province. The Band Parents Association offer scholarships for Summer Band Camps and Family account money can also be used to go towards fees.